The rumbling tummies of the swashbuckling guests demand pirate party food that is as delicious as it is creative. These party food ideas will have your guests pillaging for more. For a truly magical experience, you'll want to incorporate the pirate theme throughout the party, from the invitations to the serving trays. A cardboard treasure chest purchased from a craft store is ideal for chips, buns or other dry party foods. Plastic sea shells also work well as a creative serving dish. Use new, clean sand shovels as serving spoons for the party food. Additional accents to the food table, such as fishing nets, sea shells, toy swords and pirate hats, make the area more attractive to the young buccaneers. Chicken nuggets renamed "Gold Nuggets"
Hot dog octopus: Cut the hot dogs in half lengthwise, keeping an inch intact at the top. Continue cutting lengthwise to create 8 hot dog tentacles. Shell pasta: Use the shells to make homemade macaroni and cheese or a cold pasta salad. Apple ships: Use an apple wedge as the base, a pretzel for the mast and a cheese slice for the sails. A pirate-themed dessert adds a sweet treat to the end of the party. Many simple and adorable desserts fit the party theme. A rectangular sheet cake serves as the ship's base. Use a serrated knife to cut one of the short ends to a point resembling a pirate ship. Cover the entire cake in chocolate frosting or vanilla frosting tinted brown. Place clean pirate figures on the cake. A paper sail attached to a bamboo skewer adds the finishing touch to the cake. A treasure chest cake is another simple dessert option for the pirate theme. You'll need two sheet cakes to create the structure of the chest. Cut both cakes in half width wise. Stack the four pieces of cake on top of one another with a layer of frosting between each cake. Use a serrated knife to carve the top of the cake to resemble the curve of a treasure chest. Cover the cake in brown frosting and add the details with additional frosting. Cupcakes and cookies make dessert serving a breeze at any party because they are already individually portioned. The shape of cupcakes and cookies lends itself well to making pirate faces. Ice the surface to create the base for the face. Use icing or candies to create a red bandana for the head, an eye patch, a beard and the remaining facial features. To turn the cupcakes into a party activity, let the kids handle the decoration. This also saves you time on the prep work because you only have to bake them. All of the pirate party food will leave the guests full and talking like pirates. While the food is only one aspect of the party planning, it makes a big impression on the guests. 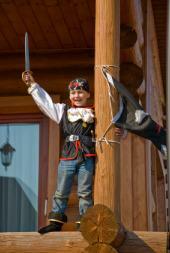 Carrying the pirate theme to the food creates an overall atmosphere of swashbuckling fun for any age.